Transition metal atoms and ions can act as Lewis acids, accepting electron pairs from molecules or ions with electrons to spare, (Lewis bases). A complex ion is a metal ion with lewis bases attached through covalent bonds, a metal complex or coordination compound is the same thing, but neutral. The coordination number is the number of ligands attached to the metal ion. Denticity refers to how many bonding sites exist on the ligand – or how many times a single ligand can bond to the central metal ion. Always name the cation before the anion. The ligands are named first, then the metal atom but all in one word. The ligands are preceded by a Greek prefix telling you how many of them there are. If you have more than one type of ligand, they are listed in alphabetical order, (ignoring the prefix). The prefixes are the standard di-, tri-, tetra-… for simple ligands but become bis-, tris-, tetrakis-… for more complex ligands. As a general rule, if a ligand name already as a prefix in it, (for example ethylenediamine) it is “complex”. Anionic ligands end in –o, neutral ligands have the same name as the compound, (there are a few exceptions: NH3 = ammine; H2O = aqua). The metal atom generally has the normal name, but will end with –ate if it is an anion. 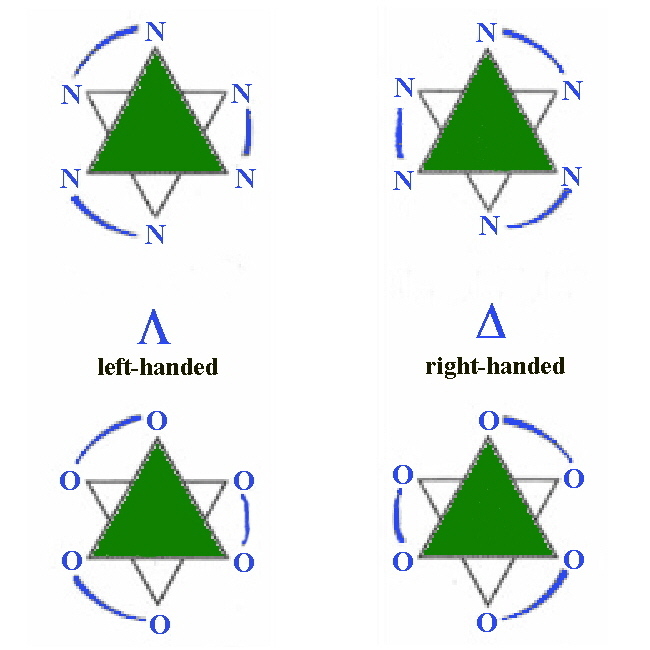 Some atoms, however, use the old-fashioned names for the anion, (eg. Cu = cuprate; Au = aurate etc). If the symbol on the periodic table doesn’t match the modern name – give it its ye-olde name. You always give the oxidation state of the metal in roman numerals. Just like your favourite part of organic chemistry, metal complexes have isomers too! And they are nearly as much fun to name. There are, as before, two main types of isomers. Structural isomers deal with differences in the way the atoms are bonded together. Ionisation isomers: where the ligands and the counterions are exchanged. Coordination isomers: are where compounds containing complex anions and cations differ by the distribution of ligands. Linkage isomers: are isomers where a ligand attaches via different atoms. Stereoisomers have the same bonds, but a different arrangement of them in space. 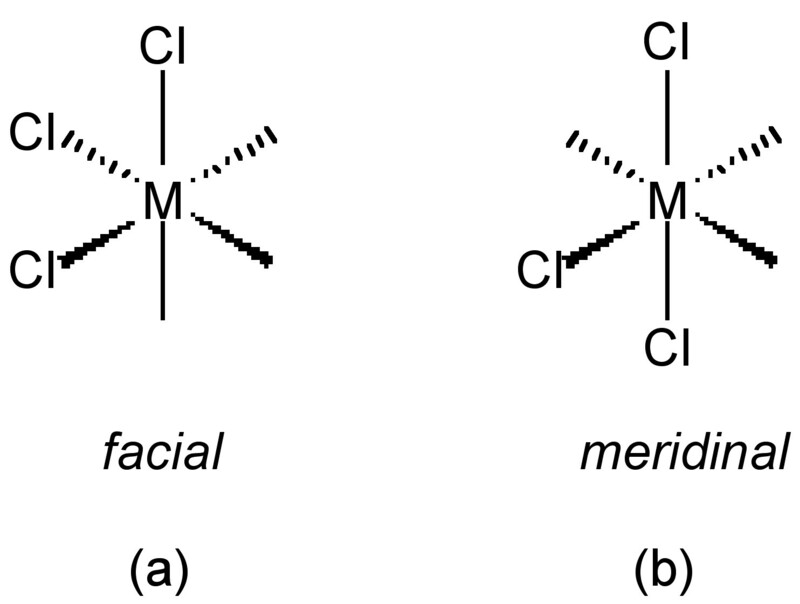 Geometric isomers: differ in the relative positions of the ligands in space.